(TibetanReview.net, Sep17, 2017) – Accusing China of striking at the heart of Tibetan Buddhism, experts have on Sep 15 called on the US government to take up with China on a priority basis the issue of suppression of Buddhism in Tibet. The occasion was a roundtable discussion on “Tibetan Buddhist Today” held by the US Commission on International Religious Freedom (USCIRF) and the International Religious Freedom Roundtable at the United States Congress. 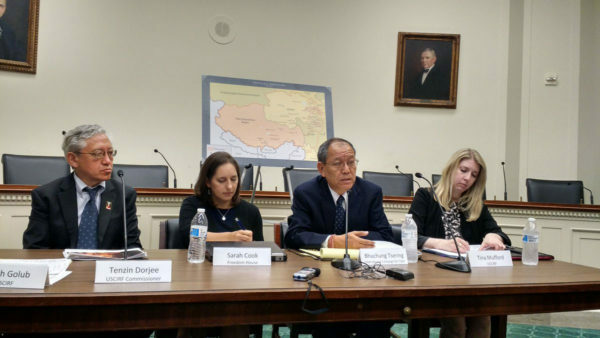 Those who participated in the discussion included Dr Tenzin Dorjee, a USCIRF Commissioner; Sarah Cook, Senior Research Analyst for East Asia at Freedom House; and Tina Mufford, Senior Policy Analyst at the USCIRF. It was moderated by Judith Golub, Director of Congressional Affairs & Policy and Planning at the USCIRF. Tenzin Dorjee said the Chinese government was implementing countless restrictions on Tibetan Buddhism and Tibetan’s peaceful religions activity, thereby creating an extremely oppressive environment. He especially pointed out that Beijing had recently appointed Communist Party members to control Tibet’s monastery education system. He said the Chinese Government was seeking to strike at the heart of Tibetan Buddhism by attacking the Tibetan religious and educational institutions. He also called the Chinese government’s assumption of control over reincarnation system of Tibet a very serious matter. And he urged the US Congress to pass the Reciprocal Access to Tibet Act, which would deny entry into the US to Chinese government officials responsible for creating or administering restrictions on US government officials, journalists, independent observers, and tourists seeking to travel to Tibetan areas. Bhuchung K Tsering, vice president of Washington-based International Campaign for Tibet, wanted the Trump administration to implement the Tibet Policy Act of 2002 to send a message to China that the US wanted a solution to the Tibetan issue through negotiations with representatives of the Dalai Lama. In this connection he wanted the Trump administration to make an early appointment of the Special Coordinator for Tibetan Issues, whose central objective he said was to encourage such a negotiation. The Tibetan Policy Act stipulates that the administration should call for “the immediate and unconditional release of all those held prisoner for expressing their political or religious views in Tibet,” he said. He wanted the US government to support the call made by the UN High Commissioner for Human Rights in 2012, urging Chinese authorities to address the longstanding grievances that had led to an alarming escalation in forms of protest, including self-immolations, in Tibetan areas. The US should support the UN call to China “to allow independent and impartial monitors to visit and assess the actual conditions on the ground, and to lift restrictions on media access to the region,” he emphasized. He too urged the Congress to send a strong message to China by enacting the Reciprocal Access to Tibet Act, a bipartisan, bicameral legislation that aims to call for the same access to American diplomats, journalists, and citizens to Tibet, just as their Chinese counterparts get in the US. In her remarks, Sarah Cook urged the Trump administration to retain China’s designation as a country of particular concern under the International Religious Freedom Act and impose additional penalties available under the law.